Pomegranate is a fruit that has been used for centuries in Asia and the Middle East to treat indigestion and antibacterial infections. Most of its effects are due to antioxidants called polyphenols. Evidence indicates that consuming pomegranate fruit extract can provide several benefits for overall health. Consult your health care provider before taking pomegranate pills. Chronic inflammation can cause narrowing of your blood vessels, leading to a reduction in blood to vital organs in your body. This in turn prevents your organs from receiving the proper nutrients it needs to function properly and increases the risk for insulin resistance, high cholesterol, heart disease and high blood pressure. Researchers at Case University found that pomegranate extract inhibits the enzyme cyclo-oxygenase, which increases the formation of pro-inflammatory cells, according to research reported in the June 2008 issue of the “Journal of Inflammation." According to the University of Maryland Medical Center, pomegranate extract might interfere with certain medications, including statins and ACE inhibitors. 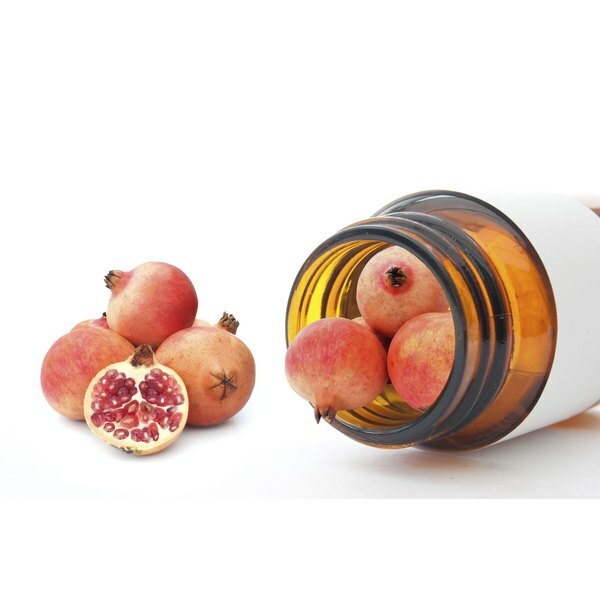 Consult your health care provider before taking pomegranate extract.